Great features and excellent performance, but there was noise in ALL of our sample images. Read more in our Full Conclusion. 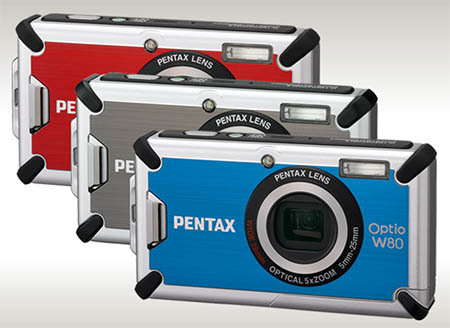 Pentax's toughest camera yet, the Optio W80, has been built to withstand an active lifestyle that most other digicams can not. This 12-Megapixel model is waterproof up to 16ft., Shockproof from over 3ft., coldproof and even dustproof. It features a 5x internal optical zoom lens, 2.5-inch LCD screen, 720p HD movie mode and multiple shake reduction options that allow this camera to compete with any other digicam in its price range as well as making it one of the top waterproof/tough models on the market. It is available in several stylish yet tough-looking colors.